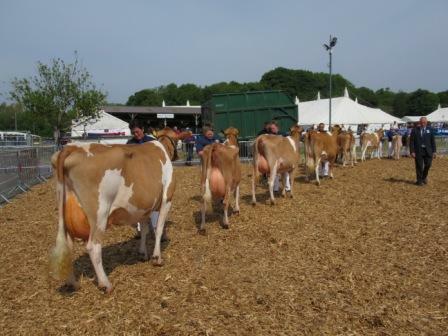 Devon County Show May 18th 2018. Judges Comments now available. 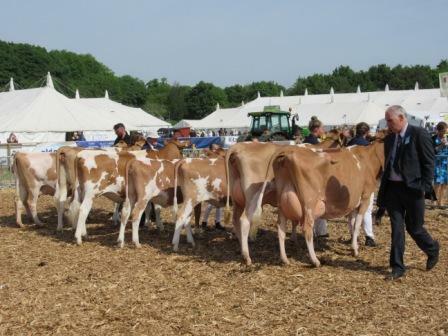 There was a really good entry of Guernseys at this year’s Devon County Show with 6 exhibitors having 19 cattle forward. 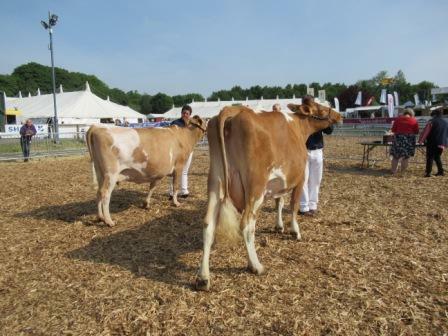 Judging was Duncan Vincent and he found his Champion in Greensfield Tiller Star Pippin from the Greenslade Family. 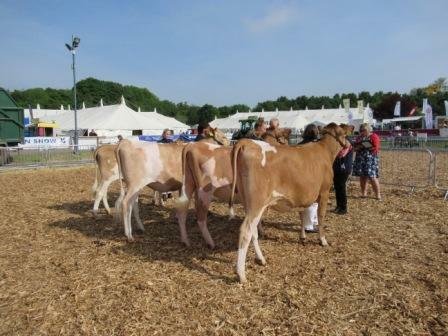 They also took Reserve with Greensfield Irish Baileys and Hon Mention with Greensfield Lady Jay. 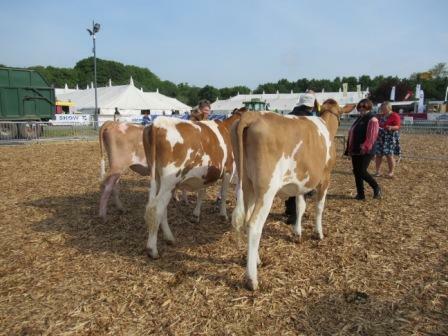 As usual, there was a very high standard of youngstock present with quality animals throughout the lines. 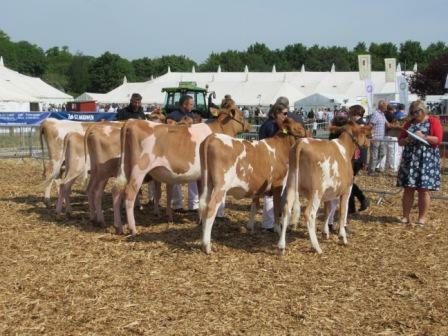 What a pleasure to judge at Devon this year with the sun blazing down and an outstanding group of Guernseys on display. A lot of work had gone into preparing these animals and it was great to see so many young handlers doing a tremendous job. The first class saw 7 animals forward which took some time to line up. Adams’ Wiltown Ernie Amy took honours for her balance throughout coupled with strength and a great top line. Richard Norman’s LL Bijou’s frame and rear leg set gave her the advantage over the younger Wiltown Patience from the Adams’ who stood above the Greenslade’s Phylis Delight due to her balance and strength. Adam’s Wiltown Annie had a fall before entering the ring and didn’t show to her best. Heifer born on or after 1.4.17. Norman. Je-Taime Double L Bijou. Marks & Hooper. Evergold Cowboy Biscuit. This class saw Adams’ Joanne topping the group with her ring presence, beautiful smooth locomotion and great legs and feet with perfect teat placement. Strength and the very well exhibited Violet by Izzy Phillips gave her the advantage over the Greenslade’s very Dairy Greensfield Manor Francine. Maiden Heifer born on or between 1.10.16 and 31.3.17. Winner of this class was Sally Phillips with Vampire Poppy who paraded herself well, showing balance with strong rear leg set giving her the advantage over the Greenslade’s Flying Diana. Her Dairy character kept her in front of Tracey Marshall’s Trish. Marks & Hooper. Autumn Gold Bramley Apple Crunch. Strength and balance gave Greensfield Lady Jay the advantage over Richard Normans Bourton Fiona 13. 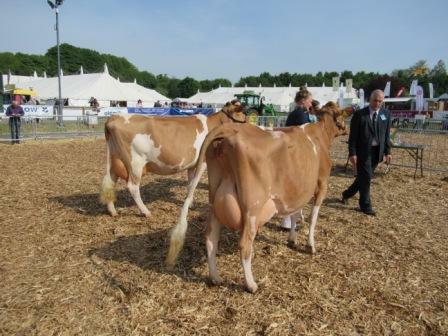 Greenslade’s Irish Baileys stood alone in the ring but was a very worthy winner with great dairy presence and strong fore and rear attachments. 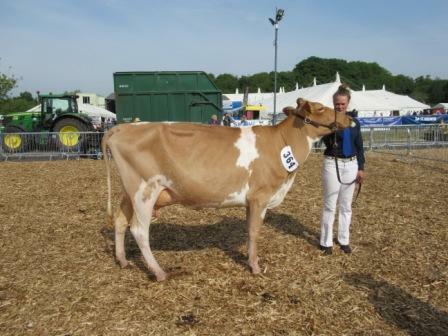 Greenslade’s fresher and very finely boned dairy cow, Star Pippin, took advantage over the strength and capacity of Adam’s Wiltown Patience. Greenslade. Greensfield Tiller Star Pippin. 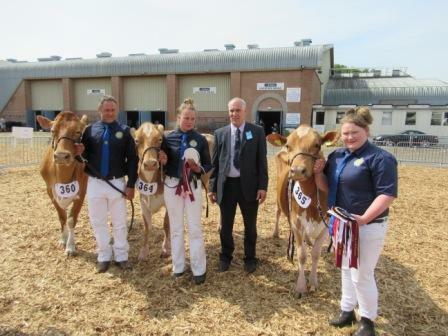 Greenslade’s in milk group took advantage over the Adam’s well balanced maiden heifers. 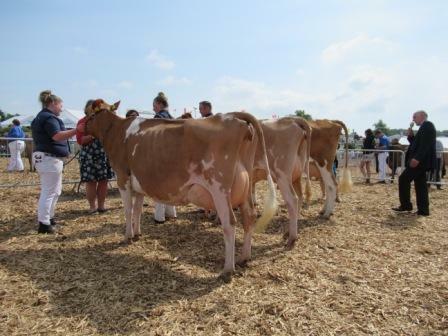 A very tight decision between superbly balanced and even pair of Ernie twins from the Adam’s and the Champion pair from the Greenslade’s who were balanced and showed great udder attachment and teat placement: the twins taking the prize for a pair by the same sire. Pair by the same sire. 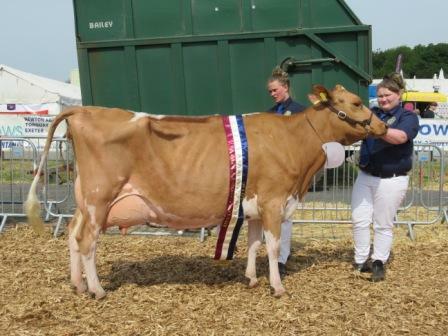 The Greenslade’s took the Championship with Star Pippin due to her fine dairy character, superior udder attachment and teat placement over their Irish Baileys in milk heifer. 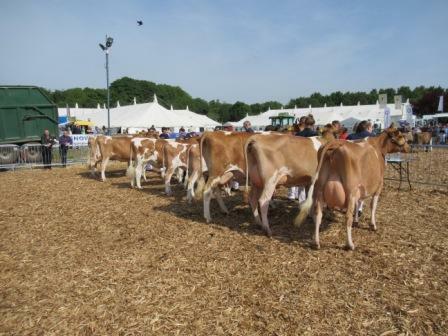 Well done again to all exhibitors, Devon County Show and the efficient and charming stewards for making it a great show. 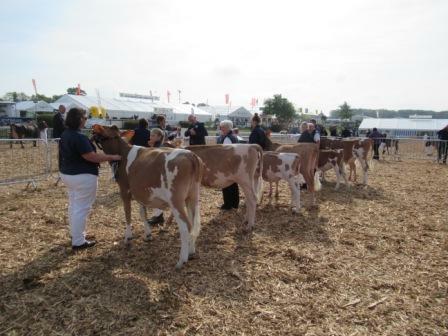 Champion, Greensfield Tiller Star Pippin, Reserve, Greensfield Irish Baileys and Hon Mention, Greensfield Lady Jay. Judge, Duncan Vincent with the winning team.